Only about 24 percent of the MTA’s 472 subway stations are considered ADA compliant, the lowest amount among the country’s rail systems in metropolitan areas. In the 62 neighborhoods that only have inaccessible stations, more than 199,000 mobility-impaired residents, 341,000 seniors and 203,000 children under the age of five live there. 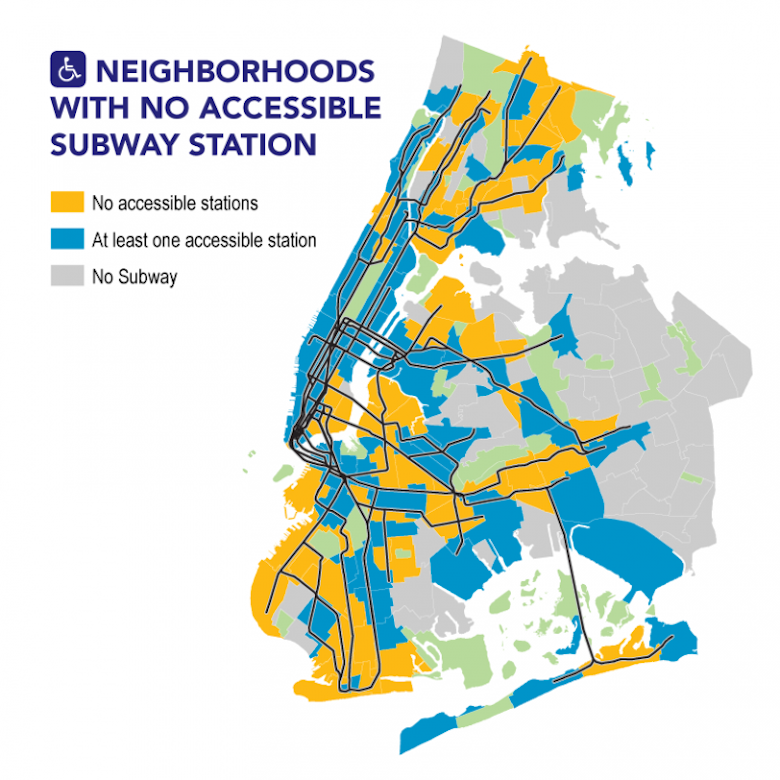 According to Stringer, inaccessible subway stations affect where mobility-impaired residents or seniors choose to live, where they work and their overall cost of living. Median rents with at least one accessible station are more than $100 higher in neighborhoods with only inaccessible stations. Expensive rents on top of pricey medical care expenses and other services further the financial strain on these residents, the report found. To address the gaps in accessibility, the MTA hired its first accessibility chief last month to oversee efforts to help mobility-impaired riders access them. The appointment comes as NYC Transit chief Andy Byford released his Fast Forward plan, which pledges to make 50 new stations ADA accessible in the next five years. But, as Stringer wrote in his report, this plan would require a lot of external funding, as well as a new system for contracting and procurement. In “Service Denied,” the comptroller suggests introducing an $8 billion Transit Bond Act in the next legislative session in order to fund appropriate ADA upgrades.